Home page is made highlight with large and nice images in Slideshow. Mega Menu is beautiful and clean. Twitter Brand slider extension shows many famous brand or logo brands you want to advertise. This design is nice and clean. Arrangement of modules and static blocks is logical. 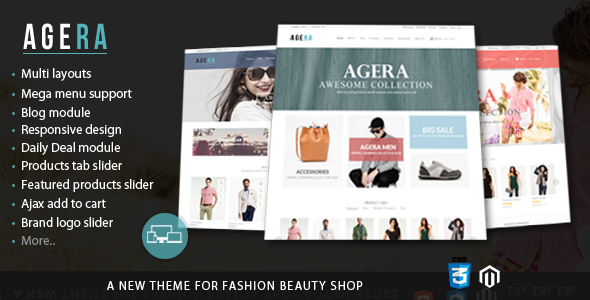 Item Reviewed: Agera Responsive Magento Theme 9 out of 10 based on 10 ratings. 9 user reviews.